(Nanowerk News) An international team, including Oxford University scientists, has been investigating what happens to the top layer of atoms on the surface of a material. The material is strontium titanate: a complex metal oxide that many researchers are interested in because of its ability to split water into hydrogen and oxygen with sunlight and its potential for use in electronic devices. 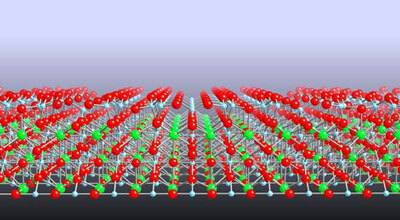 An atomic model of the surface of strontium titanate. The team used a variety of techniques including scanning tunneling microscopy (STM) to directly ‘see’ the arrangement of surface atoms. Their observations, reported in this week’s Nature Materials ("A homologous series of structures on the surface of SrTiO3(110)"), reveal a series of structures with a surprisingly close and orderly arrangement. These ‘transformations’ could prove very important to researchers hoping to use strontium titanate in order to build new kinds of nanoelectronic devices or to grow thin films. The report also suggests that the techniques developed by the researchers could make it possible to predict the surface structures of other oxides. The research was conducted by a team was led by Dr Martin Castell of Oxford University UK and Professor Laurence Marks and Professor Ken Poeppelmeier of Northwestern University, USA.